Exactly one year ago in June 2007 – Yes I know, I’m a slow writer! 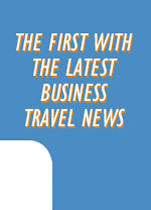 - I took part in a short press visit to Morocco at the invitation of the Moroccan National Tourism Organisation & Royal Air Maroc. And yet it’s all still so vivid that it seems like yesterday….but so difficult to put into words. 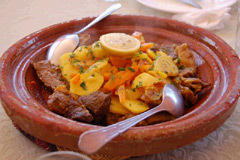 Morocco is all about sensations. Almost everywhere you go, you find mountains, desert, bustling cities & souks, real oases, hospitable friendly people…. 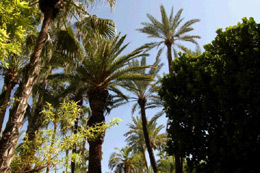 In our case we started in Agadir, travelled east via Taroudant to Ouarzazate. In short, two sides of a small triangle. Well, what follows is a complete mix of our experiences in these 4 short days… the sensations of Morocco or 10 reasons to visit this ideal destination for small incentives, teambuilding & desert adventure. The welcoming sight of the Fint oasis with its palm trees, vines & figs and a hidden village of 800 people; Kasbah Ait Benhaddou, a World Heritage site & setting for scenes in Laurence of Arabia, Jewel of the Nile & more recently Ali Baba with Gérard Jugnot; and the minaret of the Koutoubia Mosque, the iconic symbol of Marrakech. The babble of the port & fish market in Agadir where they land sardines by the bucket like in medieval times & cover them in salt; the Salam Palace in Taroudant, an oasis of peace with just the sound of a light breeze rustling through palm leaves; the hustle & bustle of the cities & souks…. The aromas of spices in the markets; Marrakech’s large open-air kitchen at dusk on Jamaa El Fna Square, a unique experience for all five senses; and the heady scent of wild rose, jasmine, azalea & other exotic flowers everywhere and especially in the Majorelle Gardens, Yves Saint Laurent’s final magical resting place…. The spicy flavours of all the wonderful fresh food - salads, kefta, pastilla, kebabs, tajine, olives the size of cannon balls, carrots in a hundred ways we have never imagined in the cold north! Yes, it’s a vegetarian paradise too. And don’t miss breakfast: fresh orange juice (of course! 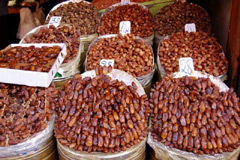 ), thick black coffee or scented tea, crepes, yogurts, breads & small sweet cakes, honey & fresh jam. The people are naturally photogenic. They’re also warm & hospitable with their sweet mint tea welcome. But in the souk, where they try to sell you their entire shop & their grandmother, you have to be tough. You bargain for absolutely everything. And there’s no difficulty in communicating in French, English or Spanish. Even children speak several languages. 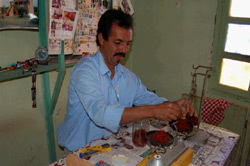 The guides are knowledgeable, interesting & fun – Hassan in Agadir; Zeïd, our 4x4 driver in Ouarzazate & Azami in Marrakech. Outside the main cities, the clock turns back and you step into another world, into simpler and almost biblical times. Morocco is an explosion of colour. All the wonderful decorative crafts provide a comfortable cocoon against the arid desert & the harsh blue sky. The ceramics, the mats, the lamps…the country is one great Aladdin’s cave! Yes, it’s a cliché – the 4x4 racing free across the desert, but it’s an exciting one just like belly dancing in Marrakech. 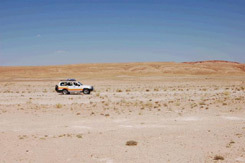 Spring, autumn & winter are the seasons for desert adventure. Nothing is what it appears to be in the Atlas Film Studios where over 30 major films have been made since their creation in 1983. Everything is fake, even the palm trees. Such is the magic of cinema! Their film credits include The Jewel of the Nile with Michael Douglas; Martin Scorsese’s Kundun; Cleopatra, Gladiator, Kingdom of Heaven and many more Hollywood blockbusters. Gladiator’s slave market is still there. The film used 4,000 extras and won 7 Oscars. And all around the studios for miles is a wonderful natural stage with real desert, oases & villages preserved in time. 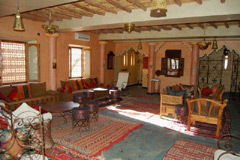 The comfort, colours & designs in the Kasbars & Ryads which offer ‘Maison d’hôtes’ style accommodation is legendary….and the quality of service is personal & excellent. Beware of all-inclusive European style hotels like the one in Agadir in which we had the misfortune to spend our first night in Morocco, totally abandoned to unimaginative all-inclusive European-style food by a disappearing tourism director… but that’s another story, and it’s all about organisation. Moral? Make sure all your arrangements are confirmed & re-confirmed, and use a top DMC. 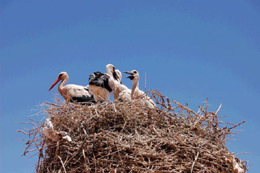 Wherever you are, whether in the city or the country, you are never far from a haven of peace, a secret place with palm trees, plants & flowers…and even the occasional family of storks nesting tranquilly, unworried by their human neighbours…. The immense landscapes of constantly changing browns, oranges & greens, the wide open skies with the Atlas Mountains always majestic in the background…..Deserted roads disappear into the horizon and nothing moves, except the occasional herd of biblical goats. And all in stunning light under a relentless sun…. Greeting – peace be with you! 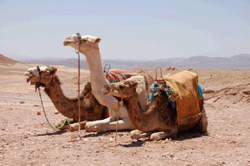 A dromedary is worth around 1000 Euros; is a traditional marriage gift and provides meat for diabetics. 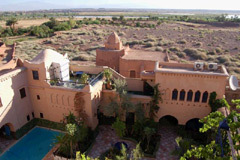 Jacques Chirac spends Christmas every year at the ‘Gazelle d’Or’ estate near Taroudant. 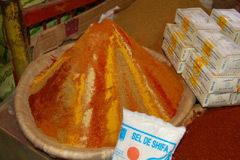 Saffron, costing 2 Euros per gram, is the traditional remedy for curing wind in babies! It is handpicked before sunrise and each small farm produces around one kilo a year. 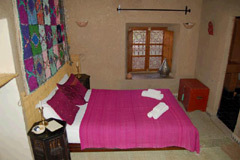 Wonderful Moroccan accommodation, lifestyle & food. Seminars & meetings for up to 20. Both owners are business consultants. 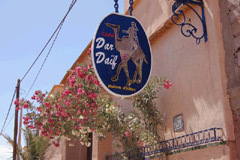 Jean-Pierre Datcharry & his wife Zineb are both qualified mountain guides and operate this small adventure company from their beautiful home & ‘Maison d’hôtes’ in the Kasbah Dar Daïf just outside Ouarzazate. 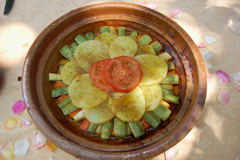 Dar Moha for lunch in a secret garden, complete with decorative pool. Dar Marjana for an aperitif on the roof terrace overlooking Marrakech by night & a delicious 6-course Moroccan dinner with quality low-key entertainment.